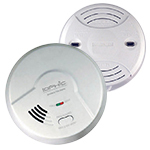 Universally acclaimed for its collection of smoke & fire alarms, carbon monoxide alarms and combination alarms, the Universal Security Instruments brand provides a definitive solution for those looking to bolster the safety of their surroundings. The USI Hardwired Carbon Monoxide Bundle is comprised of two performance exceeding and industry defining alarms that are guaranteed to provide owners the maximum in peace of mind. This USI Store exclusive includes 2 USI Alarms that ensure optimal protection against the many threats posed by carbon monoxide. 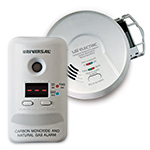 The Universal Security Instruments Electric MCND401 Plug-In Carbon Monoxide and Natural Gas Smart Alarm is a 2-in-1 device that provides double the protection with a single installation. This dual-sensing alarm protects against two deadly household threats: carbon monoxide and natural gas (or methane). Perfect for new or replacement installations, the 120-volt AC alarm is suitable for houses, apartments and mobile homes. The compact plug-in design covers only (1) outlet for a fast and easy installation with no wiring required. 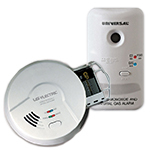 This alarm features microprocessor intelligence to eliminate nuisance alarms, a single silence/test button to quiet a non-hazardous alarm and an end-of-service life warning that sounds when it's time to replace the battery (approximately 7 years from activation). The digital display screen provides carbon monoxide PPM (parts per million) levels and displays 'GAS' during an occurrence. Peak CO levels are recorded with the memory button and (3) LED colors display the status of the alarm, power, CO and gas in your home. The 9-volt alkaline battery (included) continues protection in the event of a power outage. The USI Electric MDSCN111 Hardwired Smart Alarm is a 4-in-1 device that provides quadruple the protection with a single installation. This 120-volt AC alarm protects against (4) deadly household threats: fast-flaming fires, smoldering smoke, carbon monoxide and natural gas (or methane). Perfect for new or replacement installations, the MDSCN111 alarm is suitable for houses, apartments and mobile homes. Universal Smoke Sensing Technology responds 87-percent faster to slow smoldering fires and responds quickest to fast-flaming fires. Auto sensitivity calibration provides superior nuisance alarm protection and creates consistency in alarm sensitivity.